It may come as much of a surprise to most people given my slap-dash appearance, but I’m a self proclaimed skincare addict. As a teenager, life is awkward enough without having to feel as though you need to constantly apologise for your face, and having your biggest insecurity spread smack bang across your forehead and cheeks isn’t the easiest thing to deal with. I’m not sure if it was just me, but for some reason at the age of 13/14 the only advice medical professionals could give me was to ‘wash my face more’ and to ‘not eat junk food’. Seeing as my family allowed zero junk food in the house growing up I wrongly believed that I just had greasy skin and therefore believed scrubbing it was my only solution. How annoying then when a few years later I was told that actually I just have a much higher skin cell turnover rate than the average person, which was (and still does) wreak havoc if I wash my face too much. Thanks Doctors. Thankfully, ten years on my skin seems to be coping with life, but it’s only been the last few years that I’ve really understood the importance of a solid skincare regime. Having avoided using anything other than coconut oil on my face for years, it feels so good to finally have a routine that I feel helps my skin rather than fighting against it. 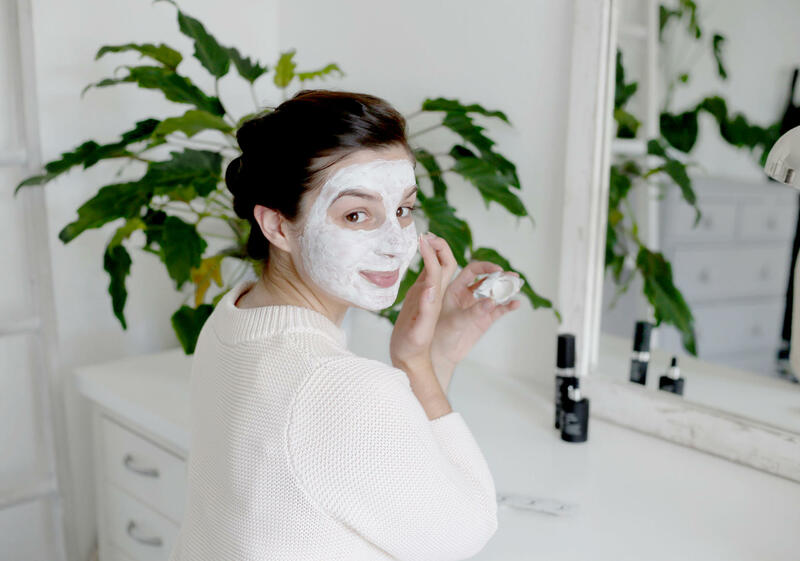 As most of you who follow me over social media know, I’m lucky enough to get to test a lot of beauty products through work – dangerous because I fall in love with so many and end up running straight to store to pick up the whole collection, but wonderful because I’ve discovered some really incredible brands that do magical things to your face. 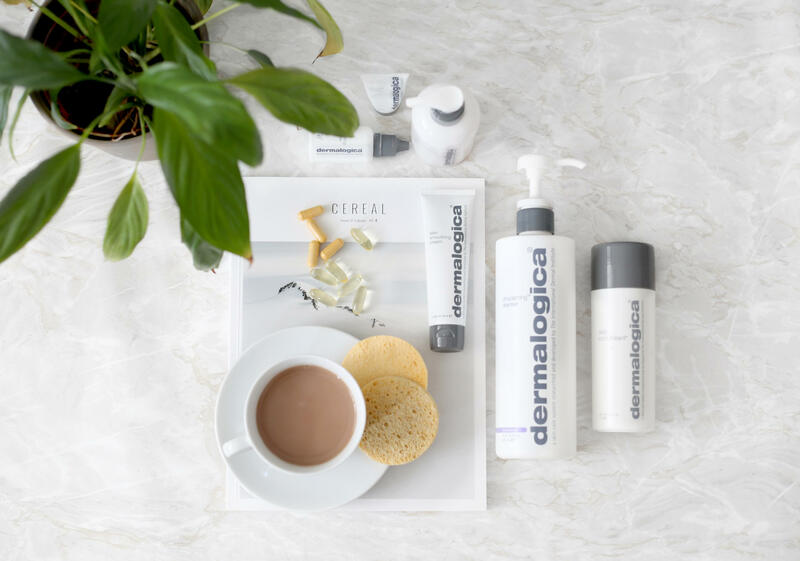 My daily routine involves a lot of Dermalogica products – I struggled for ages to find a brand that didn’t irritate my skin, but their Ultracalming collection consists of the only products other than coconut oil that doesn’t dry out or irritate my face. I always start my morning using their Ultracalming cleanser followed by their skin smoothing cream. 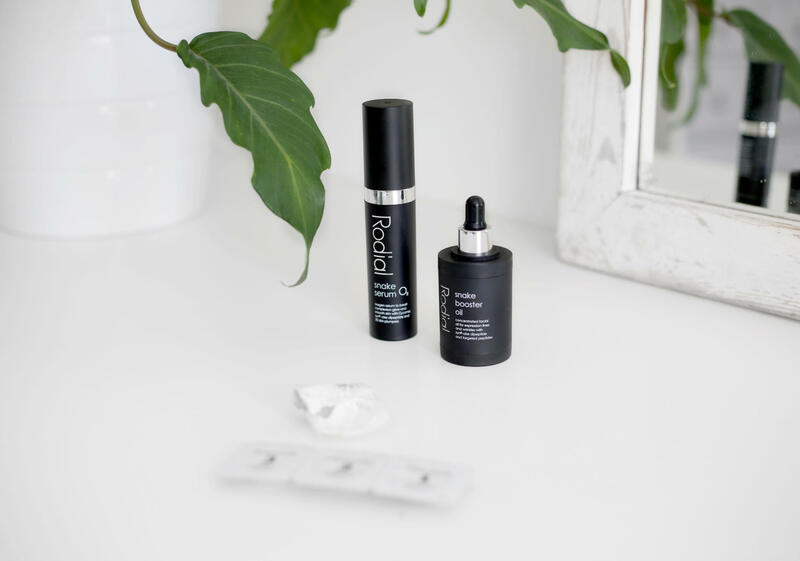 I also tend to get really dry and irritated eyes, so I usually finish with a little Skin Hydrating Booster dotted over my eye bags. 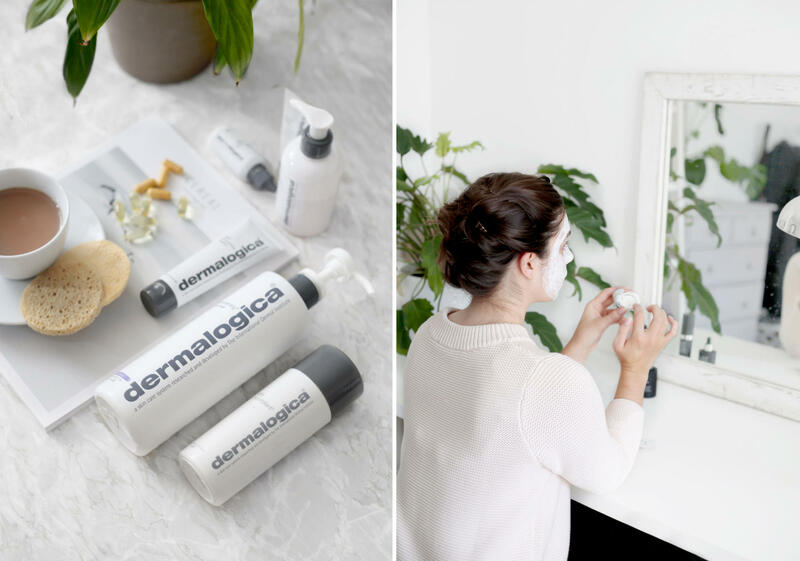 When it comes to removing makeup Dermalogica’s Pre-Cleanse is an absolute must-have, followed again by their Ultracalming cleanser and a sprinkle of their Daily Microfoliant. I’ve got some scarring left on my cheeks, so it was really important for me to find an exfoliator gentle enough to use on a daily basis that would still hep reduce the scarring. Ole Henriksen’s complexion sponges are literally my life savers when it comes to removing stubborn post workout makeup – there’s nothing worse than waking up for the gym in the morning and still having yesterdays mascara still smudged under your eyes! I’ve also recently started adding skincare supplements to my routine, something I used to be really lazy about. At the moment I’m loving Advanced Nutrition Programme‘s Skin Omegas+ which is basically a mix of Vitamin A, Omega 3 and fatty acids. Because my skin can’t really cope with heavy scrubs or masks on a daily basis I tend to use these every other week to once a month. Ole Henriksen’s power peel is hands down one of the best at home treatments I’ve tried so far. It’s pretty intense so I tend to use it once a month but it makes my skin feel like it’s actually glowing. 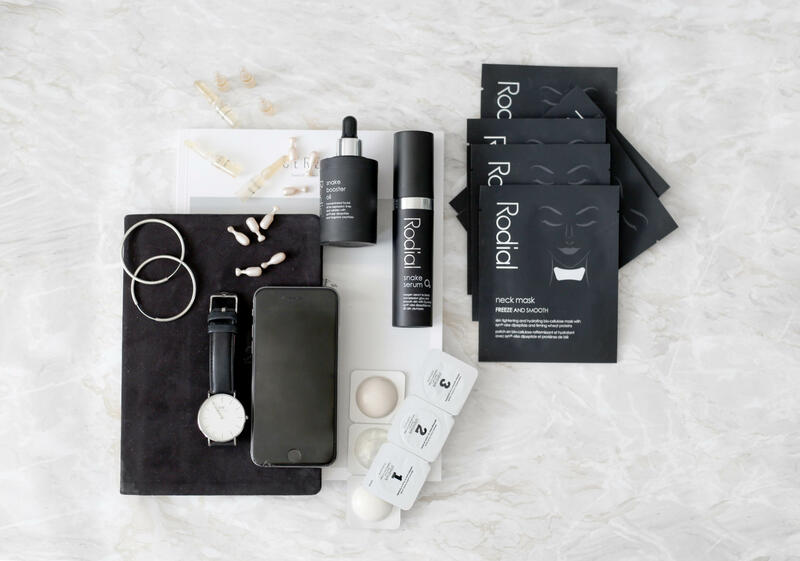 I work really closely with Rodial at work so I’m really lucky to be able to try a lot of their skincare products out. 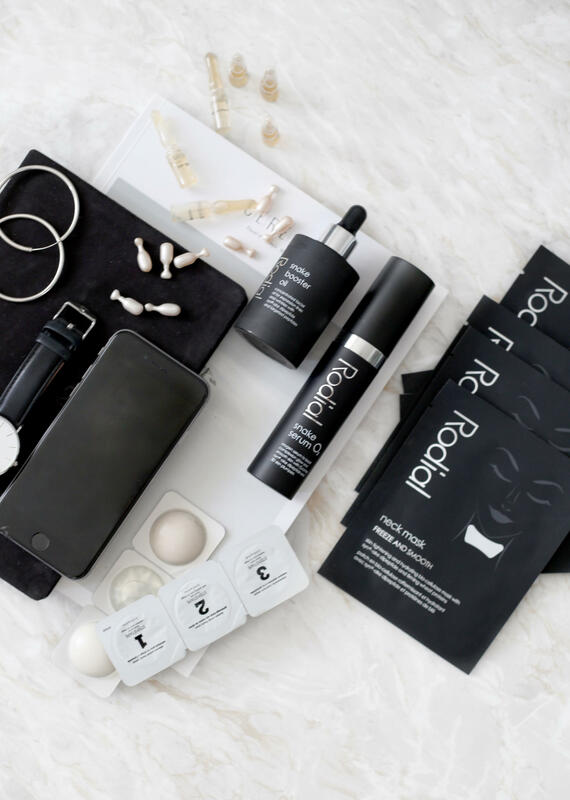 I honestly don’t know what I’d do without these babies – I tend to again use them maybe once a week if my skin’s feeling a little lacklustre, but if I could I’d definitely be wearing their Neck Masks 24/7. Another two products I love at the moment are Environ’s hydrating oil capsules. I only use these on occasion, but they’re so luxurious that I save them for days when I feel my skin really needs a pick-me-up. So there we have it! There are a lot more products I use regularly (including weekly sheet masks), but these are just a few of my current favourites. Know any other products worth a try? Please leave them in the comments below – I’d love to give them a go!